Goverlan Remote Support Blog > Goverlan v8 News > QuickTime! If you woke up this morning you probably saw that the Department of Homeland Security thinks you should NOT be using QuickTime for Windows. Well, using even a free trial of Goverlan we can detect and remove QuickTime on an unlimited number of machines in just a few minutes! Let’s build a quick Scope Action report to detect any machines with QuickTime installed. Create a Scope Actions that targets all your machines. 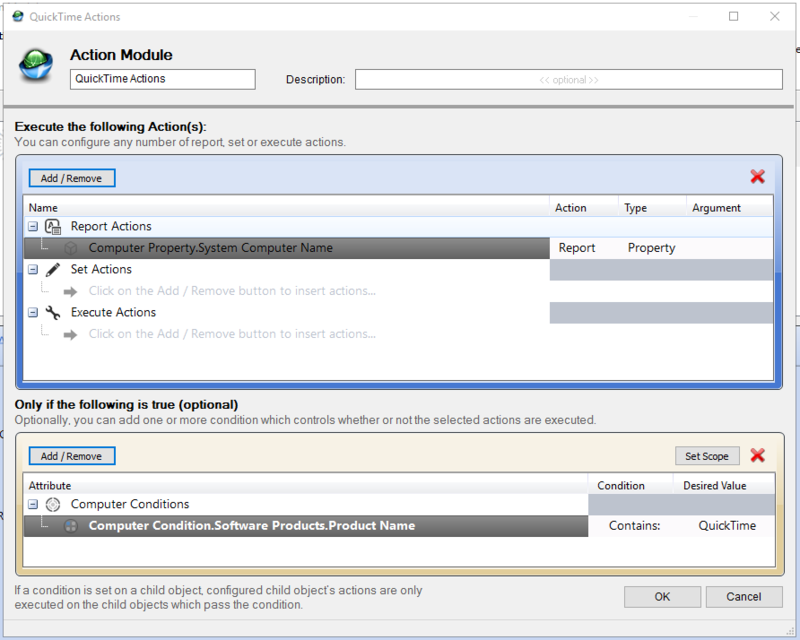 Add an Action module, that includes a Report on Computer Property >> System Computer Name. We can now create another Scope Action to remove any installed instances of QuickTime without interrupting the logged in user!